Elbląg-type Stove – the original was in the library of Nakomiady. It was built around 1760 on the order of Johan von Hoverbeck, then the owner of Nakomiady. Unfortunately, this stove didn’t survive. The “Kantor” model of stove is based on an 18th century stove from the exchange office in Uphagen’s House in Gdansk. It’s shape is so universal that it can be easily adapted for both classical and modern interiors. 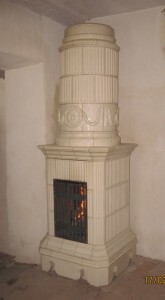 The round stove “Grazymy” is a copy of an 18th century stove from Grazymy Palace. It looks best if it can be seen from all sides. But it will also work in a corner. Dining Room Stove is based on Uphagen’s House Dining Room one. Classical shape, soft line of crown, niche – fits well to both classical and modern interiors. 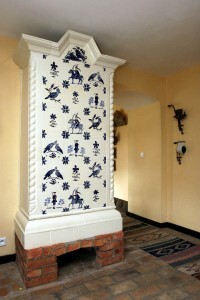 18th Century Mazurian country stove, now found the heritage park in Olsztynek. It’s a unique eample of a rustic design with a simple and attractive pattern. 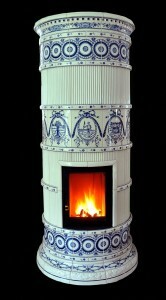 “Pear Stove”, as we call it: a unique work of art, composed of only 16 tiles – but each tile is of an enormous size. 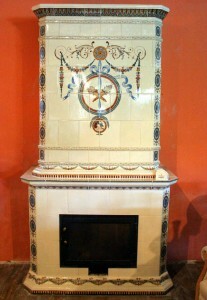 The Tea Room Stove is patterned on a stove from the Uphagen’s House in Gdansk. 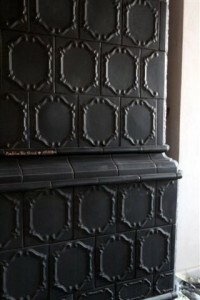 The shape of the tiles gives a marvelous effect, with baroque painted motifs or mono-chrome with a black matte glaze. Such a stove is in the VIP apartment of the Krasicki Hotel (which one a 1st prize for best hotel design worldwide in 2012). 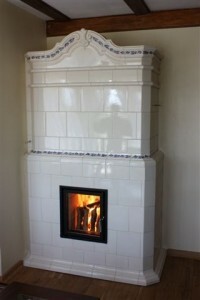 Swedish style stove – beautiful ornamentation and pastel colours make this stove simple yet very attractive. A classical stove design from the 19th century Bęsia Palace. 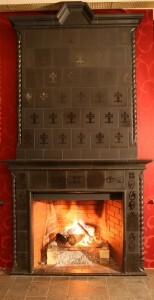 On march 28, 2012, there was a mention in “Gazeta Olsztyńska” that the original stove was pulled apart and stolen. Our reproduction is the only example available now.